released on the album "Californication"
released on the Australian bonus disc for "Californication" in 1999. Exactly how many songs were recorded during these sessions is unknown. This article mentions that 30 were, however a Rolling Stone article from April 1999 mentions only 28, a Flea interview here mentions 22, and this MTV article only says 20. This means there are probably four or five songs yet to surface. Jim Scott also mentions that the band started recording with another engineer to begin with, but quickly scrapped those sessions. It's unclear if anything remains from those few days of recording; perhaps the two untitled instrumentals are from then. Here's a whole page dedicated to the different versions of Californication tracks. Lacking overdubs, has an extra AK line at end. Extra flourishes of organ that come in early and a slightly different mix. No word if this is a mix from 1999 that accidentally got used or a new mix for the Greatest Hits CD. Outro vocals are different, go on longer. Intro vocals are different to the iTunes release, which can be considered the 'official' version. Supposedly left off the album because Anthony wasn't happy with the vocal mix originally. Guitar line is different to version released on 'Otherside' single. Different backing vocals in the end, no "on top" pre-echo. Extra before final guitar solo, extra backing vocals underneath guitar solo. Alternate guitar solo - seemingly the one John recorded live in the studio. The band referred to several songs differently in pre-release interviews and in privately circulated recordings. Fat Dance appears to be the song's official name, but it's been spelled as Phat Dance and Phfat Dance in the past. Also known as Californication Unmastered, this bootleg is sourced from a reference disc made during mixing to put all of the tracks from the recording sessions in one place, for the band or for Warner Bros. How it leaked out after that is unknown, but there are several different versions of it floating around and it is most people's preferred version of the album due to its better sound quality. 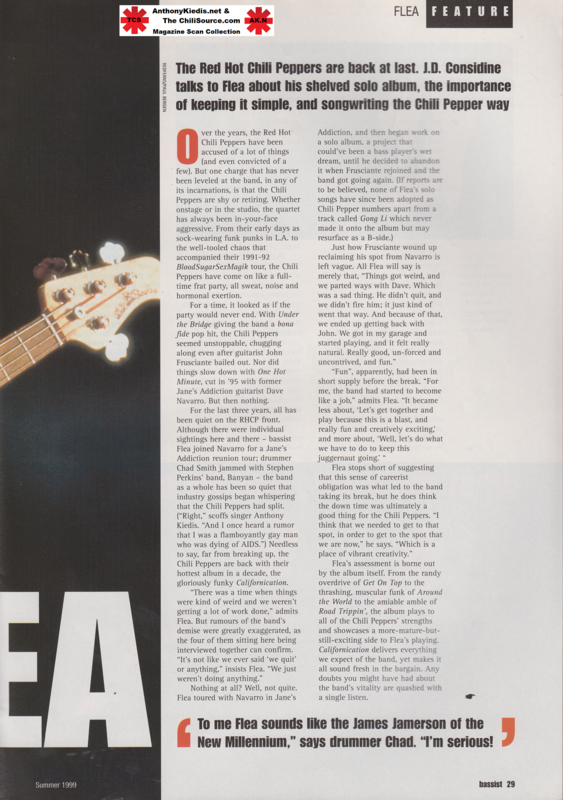 This posting mentions it being the 'original tracklist' and this posting, from the same user a few months later, refers to it as the version that Flea apparently preferred. Was Flea the source of its leak? If you're 'alexx', please get in touch and explain! There are several differences mix-wise between this version of Californication and the final retail version, most notably on the chorus of Around The World, the ending of Easily and the chorus vocals in Fat Dance. It also sounds far better than the final retail version, missing that nice sheen of distortion the band lovingly applied to it in the final mixing stages and mastering. If you have ever noticed that the retail album doesn't sound too great - listen to this. A different beast to the rough mixes bootleg. This is sourced from a CD-R made for the band with the final tracklisting, seemingly for everyone's approval before the album was mastered. Contains complete endings to all songs and the extra verse to Savior as heard on the alternate masters / rough mixes bootleg. It appears there was another, final editing session in between this disc being made and the final retail master being prepared and approved; when they removed the verse from Savior, edited the bass in Around the World, the backing vocals on Right on Time, etc. This is a CD-R made in April of 1999 (titled 'B-sides') that contains a few rough mixes of tracks that didn't make the final album. There are a couple of little curios here: Bunker Hill contains alternate mixes and Slowly, Deeply has two different guitar solos - one an overdub, one supposedly the original recording. Also revealed here for the first time is the fact that the much sought-after Blondie was, in fact, Instrumental #2 all along. Something we've trying to hear for a decade and a half ended up being... a song we already had. Such is life. This is the only source so far for a studio recording of Trouble in the Pub, whose recorded existence was a complete surprise prior to this release.